There is no charge to download the leaflets the Friends of the Flitch Way have produced. ​We hope the information helps in your enjoyment of the Flitch Way and other areas we help manage. If you have found them helpful, a donation of £2.00 would help raise funds for the Friends charity which exists to raise awareness of the Flitch Way and to help our volunteers maintain it and the other special places we look after for everyone to enjoy. The essential guide to the Flitch Way produced by the Friends of the Flitch Way and Associated Woodlands showing points of interest and refreshment along the 15 mile route. Reprinted 2017. The 4 km trail starts at Rayne Station and heads out towards Felsted. ​Copies of the leaflet are also available from the Carriage Museum. On old leaflet showing the route of the Blackwater Rail Trail between Witham and Maldon. Please be aware that the contact details are out of date. Alternative on-road route through Little Dunmow. Alternative pedestrian route through Flitch Green. Note there is a kissing gate which means this is not suitable for pushchairs or wheelchair users. 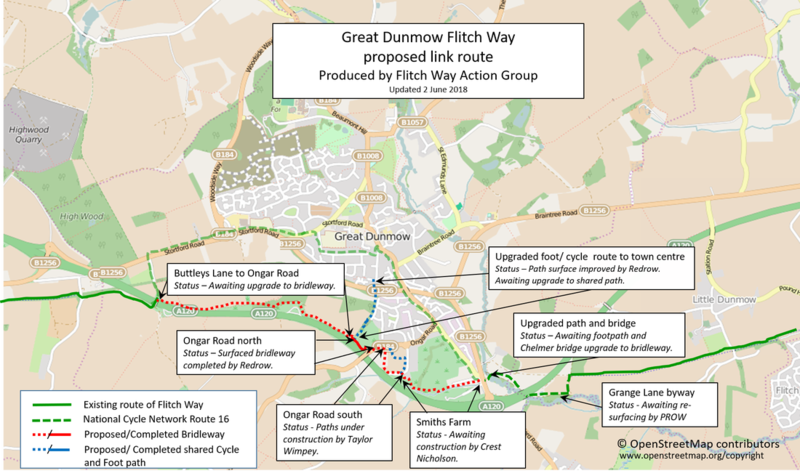 Status map showing the new planned route connecting the Flitch Way across Great Dunmow. Updated June 2018. Family friendly 5 mile walking/cycling circular route linking Great Notley and Flitch Way Country Parks. 3 mile circular walk through the fields and along the Flitch Way starting from the Green Cafe. 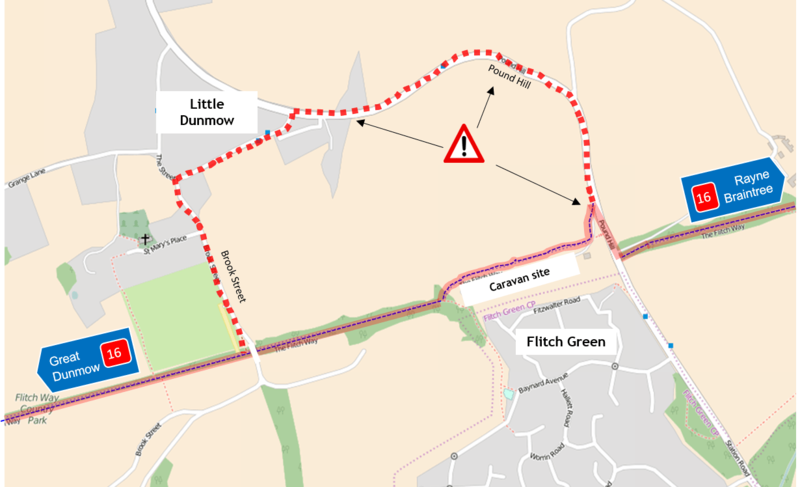 43 mile circular route on Flitch Way and quiet lanes through Canfield, High Easter, Pleshey and Littley Green with several bike friendly places to stop en route. Click image to download PDF or GPX directions. 31 mile circular route on Flitch Way and quiet lanes through Saling, Lindsell, Great Easton and Molehill Green with several pubs and cafes along the way. Click image to download PDF or GPX directions. Video about the History of the Flitch Way & Model Railway Exhibition event held on 4 May 2015 by DT Films. Paolo Morena performing in and around Rayne Station as part of the Rayne Festival celebrating Stage 3 of the 2014 Tour de France. The Elopement by Day and Knight Photography, and the accompanying photo shoot around Rayne Station and Carriage Museum. Braintree harmony trio Next of Kin filmed the video for the song "Can't find me" at Rayne Station in 2013. The song featured on the TV show the X-factor. The band have since changed their name to the Bass Brothers and are now known as Essex County Music. ​Short film by Edward Thorp (British Film Institute archive) of the Witham to Maldon East railway.